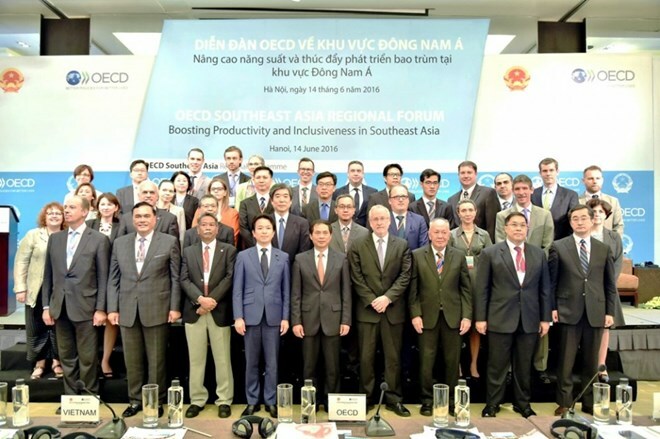 Hanoi (VNA) – Boosting productivity and inclusiveness is crucial for Southeast Asian countries in the building of the ASEAN Community, said Deputy Foreign Minister Bui Thanh Son while opening the Organisation of Economic Cooperation and Development’s (OECD) Southeast Asia Regional Forum, in Hanoi on June 14. To this end, ASEAN member countries should focus on creating more productive jobs, while ensuring good preparation in terms of institution, infrastructure and human resources, he suggested. This will help member countries make full use of their opportunities, benefit regional economic connectivity and narrow the gaps in growth and education-training between member states, he added. The diplomat stated that Vietnam tries its utmost to responsibly contribute to promoting integration and narrowing the development gap among ASEAN countries in a hope to build a Community of equal and harmonious growth. Speaking at the event, which is being held in Vietnam for the first time, OECD Deputy Secretary-General Douglas Frantz said that Vietnam ’s hosting of the forum shows the country’s commitment and effort in strengthening cooperation between the organisation and ASEAN. Frantz recommended that the association’s members should invest more on education in order to enhance the skills of labourers, while improving the business environment, supporting small and medium-sized enterprises in taking part in the global value chain, and ensuring social welfare. Meanwhile, Japan’s Deputy Foreign Minister Masakazu Hamachi held that ASEAN is a development centre of the world with abundant growth potential. He affirmed Japan ’s commitment to continuing to support ASEAN countries through different cooperation frameworks in order to boost productivity and inclusive growth. Japan will also continue to coordinate with the OECD during the implementation of the organisation’s Southeast Asia Regional Programme, he pledged. The forum, themed “Boosting Productivity and Inclusiveness,” gathered more than 200 delegates and experts from the OECD and ASEAN member countries. On the occasion, Deputy Foreign Minister Son had a meeting with OECD Deputy Secretary-General Douglas Frantz, during which both sides expressed pleasure at the fine partnership between Vietnam and the OECD. Frantz hailed Vietnam ’s development potential, affirming that his organisation wishes to further ties with the country and will work closely with the Southeast Asian nation in conducting the bilateral affiliation plan for the 2016-2020 period, with priority on economic reform, investment environment improvement, green growth and sustainable agriculture. The two sides have also agreed to increase coordination during APEC 2017 in fields of shared interest.